I was leaning over the sink washing my hands, when suddenly something grabbed my neck! I gasped and immediately looked up to see who was trying to harm me. It turned out to be the hood of my sweatshirt reacting to gravity. Good night. PRchica422 (3:55:29 AM): YOU ARE AWESOME!! If you had money to burn, would you burn it? It would be better if you gave it to charity. So, if you have money to burn, donate it. violation took place on November 26. Hotmail correctly tells me that I received the email on December 4th, (today) but the "sent" date stamp is November 5, 2003. Ah, Microsoft. Microsoft Entourage correctly identified a message from the "Hotmail Staff" as junk mail. Finally Microsoft gets something right. Did he not see today's first post? Those of you who know Blake know that he is extremely proud of his cellular provider, Verizon. Well, I called him from my phone tonight to wish him a happy birthday. I had a strong signal, but after about a minute into our conversation, the connection was dropped. Of course it couldn't have been The Duder's phone, could it? Well, when he came back online, (he had been having trouble with his Internet connection, my connection, by the way, is just fine) I asked him what happened and prepared to apologize for my bad service. Skier Wysz (12:05:23 AM): what??? Skier Wysz (12:05:28 AM): you have bad service? Skier Wysz (12:05:36 AM): mr. I HAVE THE BESTEST SERVICE EVER? Skier Wysz (12:05:57 AM): where's your verizon now, loser? Skier Wysz (12:06:01 AM): can you hear me now? I'm sure most people don't think this is funny, but our friends should love it. Happy birthday to Blake. He's 20. Things are on fire over at WOC. That was the first time I ever had to go through a security screening to see a movie. Let us all say thank you to the Office of Residential Life, keeping residents like myself safe from other residents like Mr. Houle. Without the strict Safety Checks and Closedown, Mr. Houle would have been allowed to keep his fish in a fishbowl located in his room. That's right, he was giving a fish asylum in the very same building that university students live in. One can only imagine what could have happened if this blatant violation of the University's Pet Policy was allowed to continue. What if somebody tried to eat the fish, got his or her head stuck in the bowl, and drowned? We cannot afford to take such risks. Brendan Houle, you should be ashamed. In the latest installment of Marzipan's answering machine on HomestarRunner.com, Homestar sounds like he's speaking in reverse at one point. I hijacked the audio and then reversed it, and it still sounds like jibberish. So, sorry kids, no hidden message from Homestar. Also, special thanks to Ted for telling me about the answering machine update. They're taking stuff that's not even there! Today I checked my mailbox and found a letter addressed to me from the Housing Department. 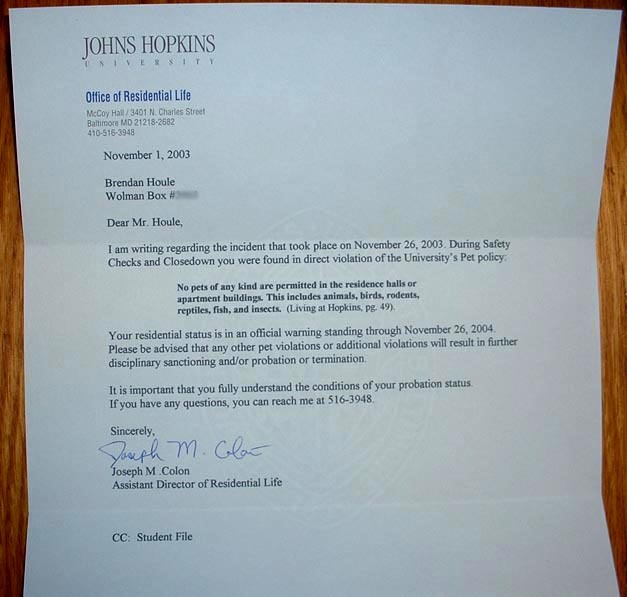 According to the letter, on November 26, 2003, they "performed a closedown Health and Safety Inspection" of my room. During this inspection, they found and confiscated an illegal cooking appliance. Did I not read the Community Standards and Policies brochure that I recycled on the first day of school? The confiscated item was identified as a "Rival - Hot Water Pot." The funny thing is, I have never owned such an item. Maybe it was in our bathroom or something, and belongs to one of my suitemates. I may never know, because I don't care. I just thought it was funny. I'm alright, folks. Just a little nap to avoid my paper. shkenblke2 (2:45:30 PM): r u feeling ok? Auto-Response from Skier Wysz (2:45:31 PM): paper due tomorrow... so i'm asleep. shkenblke2 (2:46:20 PM): the only thing normal about u rite now is th@ ur shirking ur work? shkenblke2 (2:46:29 PM): should i call a doctor or sumthin? iPod ad here, iPod ad there, iPod ads are everywhere!